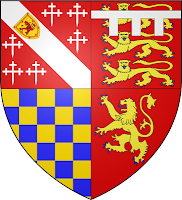 The title Duke of Norfolk is the oldest non-royal still existing duchy in England and was created on 28-6-1483 for John Howard (ca. 1430-1485), a grandson of Thomas de Mowbray, Earl of Nottingham and Duke of Norfolk of the first creation on 29-9-1397, who on his turn was a grandson of Margaret 2.Countess of Norfolk and granddaughter of Edward I King of England. The eldest ancestor Sir William Howard (ca. 1242 + ..-8-1308), of possible burgess stock, was a Judge of Common Pleas and owned land and a manor house in East Winch, Norfolk. Thomas Howard, 4.Duke of Norfolk (1536-1572) married as his first wife Mary Fitzalan, daughter and heiress of Henry Fitzalan, 19.Earl of Arundel. 67. Augusta Jones Saint-Paul * … + 25-5-1841; Dr van Sir Horace St P., Bt. 73. Mary Juliana Gerard * ... + 9-2-1827; Dr van Sir Robert Cansfield G., 9.Bt. 75. Elizabeth Lyon * ... + 1-12-1834; Dr van David L.
81. Theresa Apollonia Wakeham * ... + 8-11-1846; Dr van Edmund W.
97. Harriet Little * ... + ...; Dr van Richard L.
107. Mary Wilkinson * … + …; Dr van John W.
120. Thomas Soden * Coventry 13-10-1798 + 8-2-1868; Zn van William S.
83. Marcia Bridget Fox * … + 10-6-1826; Dr van James Lane F.